About a week ago, I put out an SOS for summer reading for my beach trip. I received a ton of really great suggestions, but one stood out. Not only did the fabulous Lena recommend “I Loved, I Lost, I Made Spaghetti,” by Giulia Melucci, but she even brought her copy to me to borrow! Lena was right, this book made the perfect beach reading. Even though the actual narration of the book was great, the recipes sprinkled throughout stole my heart. By the end of the book, you have a great feel for Guilia’s cooking style, and you have seen enough of her recipes to be able to adapt her style to your own. I only expected a beach read, I did not expect to get my cooking motivation back….but that is exactly what happened! As I was reading, adaptations of Giulia’s recipes kept popping into my head. Believe it or not, I couldn’t wait to get home get cooking again! This recipe was inspired by the book, as well as the tomatoes and peppers that came off of our patio plants when we got home. The tips I received from Guilia did not disappoint. I was able to adapt her base cooking method, and the results were spectacular. This is a very simple summer pasta recipe, and you can mix and match the ingredients however you choose…But it is best when you can throw in a little something from your personal garden! Cook, stirring every so often, until sausage is brown. About 8 minutes. While the sausage is cooking, begin cooking your pasta according to the instructions on the pasta package. Drain the fat from the sausage, and move cooked sausage to a bowl for use later. Cook peppers, stirring often, for about 5 minutes. Peppers should not get soft, just tender to the bite. Your pasta should be ready by now. Drain it and set aside. Add the cooked sausage to the pepper and onion mixture. Increase heat to medium-high and cook, stirring often, for 5 more minutes. Add torn basil leaves and stir. 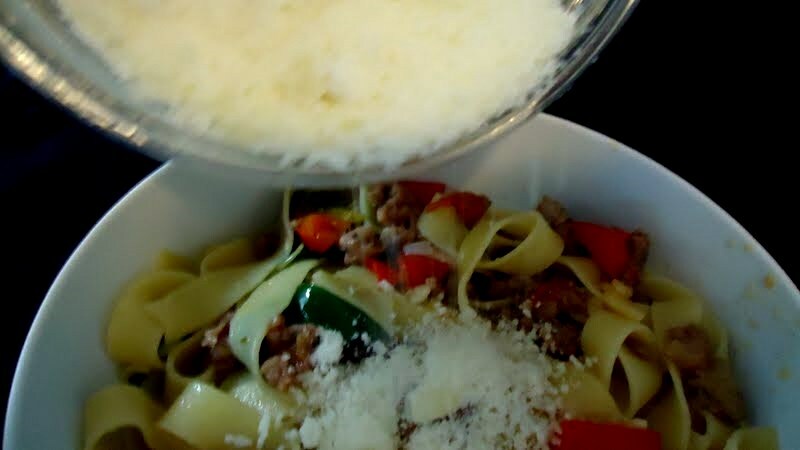 Add cooked pasta to the sausage mixture, drizzle with remaining tablespoon of olive oil and mix well. Reduce heat to low and cook, stirring frequently, for an additional 3 minutes. 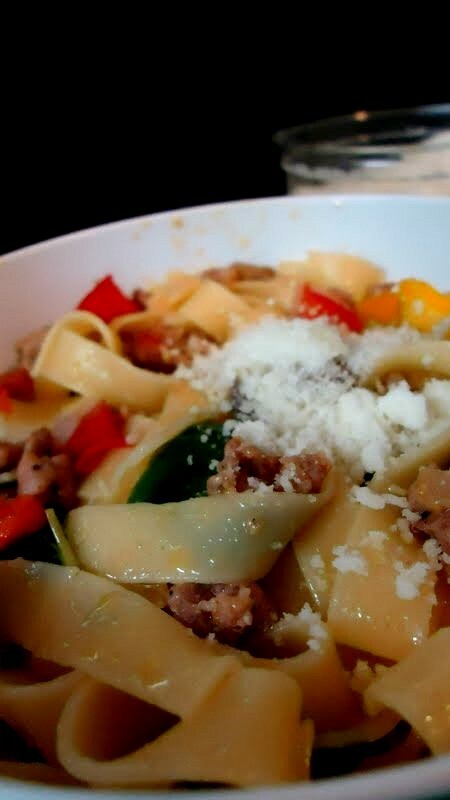 Place pasta mixture in serving bowls and sprinkle with cheese. 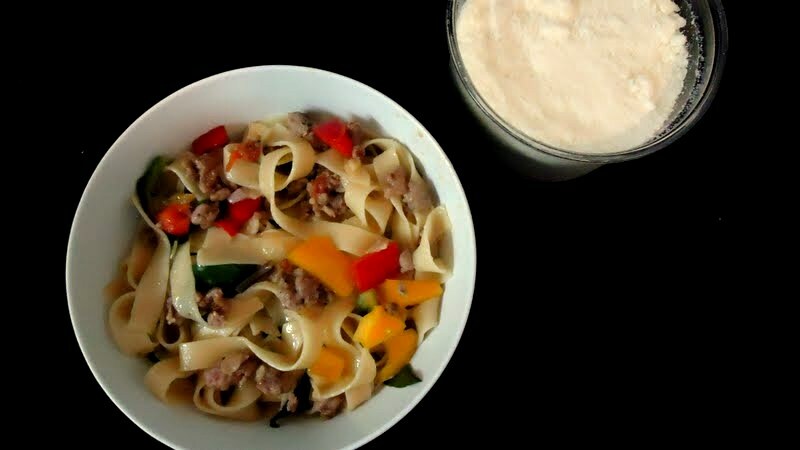 This entry was posted in Recipes and tagged book review, dinner, main course, pasta, recipe, sausage, vegetables by reneeh. Bookmark the permalink. Those peppers looks like proper peppers, not these things you get in supermarkets that are supposedly “perfect”. Lovely. Looks delicious, also. Thanks! 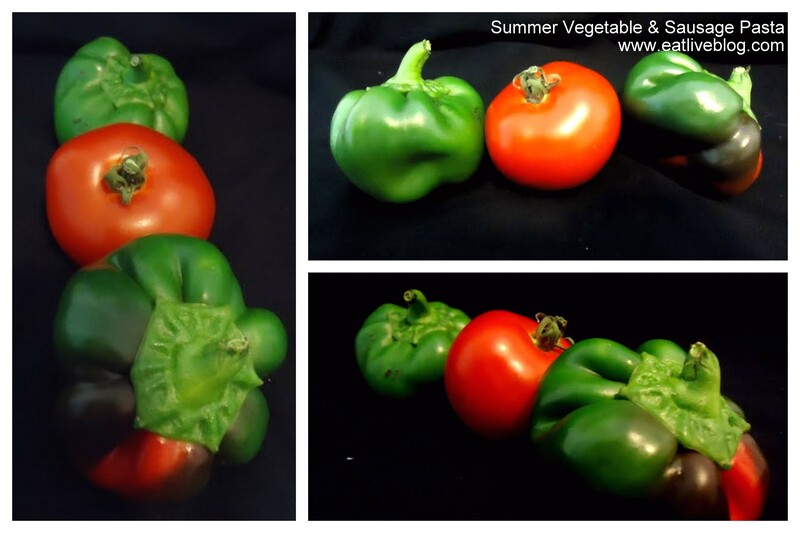 No matter how many of our own veggies we grow, I get so excited each time we get to eat one! Oh you will love it! It is such a quick, fun read! I definitely am adding this book to my wishlist! I started reading that book and then set it aside because I got busy, and I forgot to pick it back up! This is such a great reminder. As I mentioned on FB, I made something similar for dinner tonight. 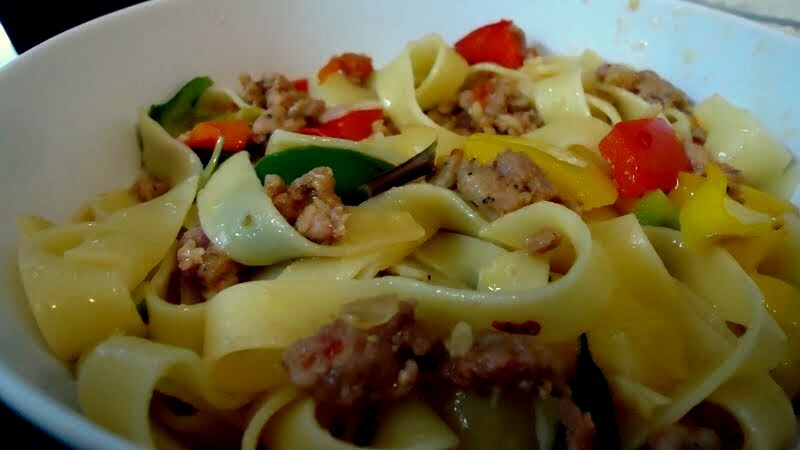 I actually made a tomato sauce with onions and red bell peppers (and basil and garlic of course) in it last night and then tonight added some sausage to it and had it with mini farfalle. How wonderful that you got to use your own peppers and tomatoes! My tomatoes are just not ready yet and my peppers are tiny babies still. Cannot wait! This looks absolutely delicious. I’ve heard of that book before. It sounds great. I need to add that to my reading list. hi renee, your pasta looks delicious and flavorful.. nothings tastes better than the natural sweetness of fresh veggies harvested from own garden. You’re the cutest. That book sounds a lot like the one that Molly from Orangette wrote actually, have you read that?… I think it’s called a homemade life… SOOOO good. Also – yum fresh veggies you brought to fruition yourself! Keepin it local. I am definitely checking out that book too! Thanks Kathy! I’m so jealous you can grow tomatoes and peppers!! I would loove to have the outdoor space to do that. tonight. I will add some sundried Tomatoes as well, my latest craze. Peppers and tomatoes just don’t grow in my garden:( Your pasta looks delish. The thought of you using home grown vegetables makes me drool.